1. Academics are important – but relationships are more important. Always remember that the child is more important than the work. I know you agree, in theory… but sometimes when one is correcting a wiggly, uncooperative kid – for the fourth time in an hour – it’s hard to remember. Put away the math book. Stop and talk for a while with your child and try to determine what is going on in his head instead of just lowering the boom. 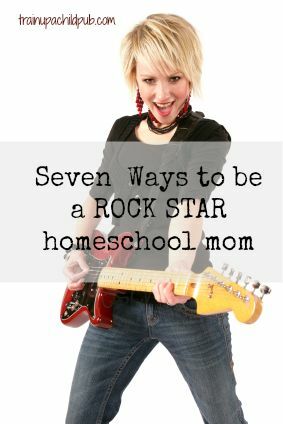 This is point #1 for a reason – to be a rock star homeschool mom you need to remember this one no matter what. In the same vein, relationships with siblings are more important than the work. In our house it’s not permissible for siblings to fight and tear each other down physically or verbally. Stop and referee, require apologies and make things right before trying to get back to work. One more relationship to talk about – the one between you and your husband. Don’t put that on the back burner for 15 years while you teach school. It is SO easy for us to put the kids before our marriage, and when we do so we are not doing ourselves or our children any favors. 2. Don’t stress over things you can’t control. 3. Worry about the big things and let the little things take care of themselves. Where are are your children in terms of their spiritual life? This is of utmost importance in our home. If it is in yours, too, is it reflected in your daily conversation and how you spend your time? You might even want to create a homeschooling plan that reflects this priority. Teach your kids how to discipline their minds to listen, to learn and to find information on their own. Train them to own their own work, manage their own belongings (including school supplies) and their own spaces. Give your children opportunities to serve others and rub shoulders with people of all ages. Teach them to communicate with others politely, tactfully and kindly. 4. Study your children; identify their passions and how they learn best. What do they enjoy the most? Is there something in particular they like to do in their play time? What grabs their attention? Do they talk about a certain subject? What do they like to read or learn about in their free time? What do they learn quickly and easily? Do they automatically grab a book or search the Internet to learn something? Are they listening to music most of their waking hours? Do they like to talk about what they are learning? Are they ALWAYS moving? Do they like drama? Art? Music? Playing with Lego blocks? Educate yourself about learning styles and try to identify yours and theirs. Give them a chance to use the things they like (art, music, cooking, organizing) in their assignments. It will help them engage in and enjoy school more. 5. Cultivate a love for learning. The best way to do this is to be an enthusiastic learner yourself. Generate some excitement about learning new things. READ. Let them see you read. Provide lots of stimulating reading material – at or below your children’s reading level. Let them choose whatever they want to read for a daily fun-reading time. (Shh- this will also improve their reading comprehension and fluency, but don’t tell them.) This is not a school thing, it is a fun thing. (It is all in the marketing.) Go to the library frequently. Choose to buy magazine subscriptions in the areas of your child’s interests for Christmas and birthdays. Talk about what you are learning. Regularly go around the table at dinner telling each other about the most interesting or surprising thing you learned that day. 6. Take the time to be prepared. Avoid clutter like the plague. Take time to prepare lessons in advance. Ask yourself — do I understand this? Do I need to look anything up first? Do I have the supplies I need? Have I allowed enough time for this lesson? What are the younger ones going to do while I teach this? Ask your husband or a friend to take the kids for a few hours a week so you can plan and prepare for the next week. 7. Don’t try to be a friend to your kids. They need you to be a parent first. I’m not suggesting that you be an authoritarian or dictator, or that you shouldn’t worry about ‘getting along’ with your children. I’m just recommending that you be a parent first – set clear expectations of what is acceptable behavior in your home and how children are going to behave when school is in session. When you assign school work, make sure your children understand exactly what you expect. Be consistent with your discipline. Expect children to always be respectful to you and other adults. You are laying a foundation for them to be secure, for school to be successful and for friendship as they become older. Do any of these particularly resonate with you this year? Would you add anything else to my list? This is good stuff! It is so important to remember learning is about so much more than academics. Kids will follow your example. If you model a love of learning, of stretching and growing yourself, your kids will do the same. When they see that all of life is an opportunity to learn and to improve, they will cultivate a lifestyle of learning that lasts a lifetime. I love your tip about letting them choose free time reading material – they are doing “school” but don’t realize it. “its all in the marketing” LOL I love the way you think. Many great reminders of what is most important! I am learning that leaving a small amount of margin does leave a really big difference. Thank you for passing along the wisdom gained from your experience! You’re very welcome, Aliece. Thanks for reading and taking the time to comment! Margin is a tough thing to successfully manage, but pays great dividends when we can do it successfully. We need to hear this over and over. so very true!!! Adrienne – I am thrilled to hear Train up a Child Publishing (formerly Epi Kardia) curricula is working so well for you and your family! Yay! Thanks SO much for taking the time to tell us! Christine – Good to hear from you. I know what you mean – we have to constantly remind ourselves what is truly important – at least, I do. 😉 I’m glad you enjoyed the post. Thanks for taking the time to comment! This is the best “back to school” message I’ve read in a long time! It’s one of those convicting-yet-gentle inspirations that you need to pull back out after Christmas break when “curriculum” or “schedule” remorse sets in–you know, that time of year when you doubt everything you’re doing, get on the interet to research where the greener pastures are! Thank you so much for the virtual coming-alongside..it is so appreciated! HI! I just wanted to let you all know…. I AM SO HAPPY!!! I have been wanting to use Train up a Child Publishing/Epi Kardia since we started homeschooling. This year my husband gave me the go ahead and WE LOVE IT!!! I knew we would!!! Hi Cheryl, It is nice to ‘meet’ you! Welcome back to homeschooling! I remember meeting Dwight and Bethany Huthwaite a while back when they were members of our local homeschooling support group – haven’t seen them for a while though – are they still homeschooling or have I just missed them? Yes, I am familiar with St. Andrews and have several friends that attend there. It is a small world, as they say! Yes, with our curriculum you study the same thing at the same time with all of the kids. Much easier! 🙂 I would be happy to talk with you further and answer your curriculum questions – please email me at dana@trainupachildpub.com. Thanks for taking the time to comment! I’m looking forward to talking with you soon. Starting HSing again after 4 years. Was a huge CM fan. Used Sonlight…but became bored with it. I heard from a friend that My Father’s House was GREAT, but the cost is WAY more than this Missionary Family can afford! I then tried Heart of Dakota, but there were too many words to even take in as I researched their website. Then I came across your website. I REALLY like it! I have 5 children…4 in school…K, 3rd, 5th, and 7th. How can I purchase what I need for these ages? and does your curriculum work like MFW where all the kids can do it together as a family? I see that you are from Mt. Pleasant, SC…our best friend is Dwight Huthwaite who is the worship leader at St. Andrew’s church. We also are newly missionaries in New Bern, NC with Pastor Mark Cooke who used to attend St. Andrew’s. Just curious if you are familiar with that church or not?